The High Line was once an elevated train line, but after decades of disuse, it was saved and transformed into the space that we know today. It is my favorite public park in NYC, although if I'm being honest, 90% of the time, it's just a godawful tourist trap. At peak hours, the path becomes so packed with herds of slow-moving crowds that my friend's mom once described it as 'like waiting in line at Disney'. Maybe this is the wrong venue to air these grievances, since anyone reading about the High Line is probably a prospective new visitor, but I'm sure you don't want that either, right? Photos cluttered by masses of random people? So it shouldn't be surprising then that my favorite times to go are at odd hours and during or immediately following inclement weather. Trust me. It's worth it. 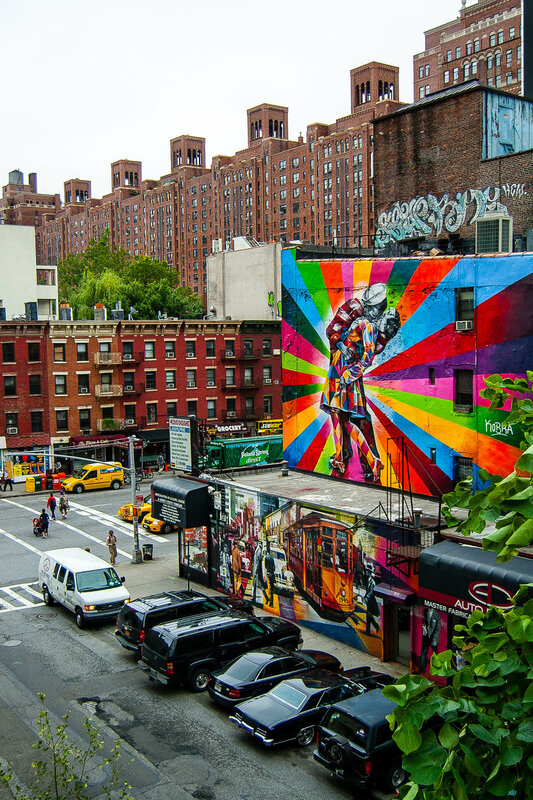 Unfortunately, if you were hoping to see the above Kobra artwork, it is no longer there!